Atla Annual welcomes exhibitors and supporters to take part in a variety of events at our yearly conference. Exhibitors enjoy benefits such as complementary conference badges, discounts on advertising, and access to conference attendee mailing list. We also offer conference sponsorship to exhibitors and other entities in support of our mission at five different levels. Join us for the upcoming Atla Annual June 12-15 in Vancouver, British Columbia, Canada, at the Sheraton Vancouver Wall Centre. We recommend that you save this PDF to your desktop before emailing. Once we have received an order form, staff will be in contact with you with the Exhibitor contract (if applicable). Exhibitors and other interested parties can support the mission and goals of the Association through the generous support of conference events. Available at five different levels, you’ll find a sponsorship opportunity to match your marketing needs and budget. Each level offers many benefits. The perfect opportunity for you to communicate your sales message. This opportunity is available for both conference exhibitors and those unable to attend. An electronic version of the program book is available to all Atla members. Acceptable file formats are PDF or EPS. All ads must be grayscale, except for the inside front and inside back covers. Submit your advert to the designer at exhibits@atla.com by Wednesday, May 1. Link your organization’s webpage from the 2019 Atla Annual SCHED site from the time payment is received through July 31, 2019. Cost: free for Affiliate Members ($150 USD per link for non-members). Make sure that all conference attendees see your promotional materials. Have them inserted in the conference tote bag for only $100 USD per item for Affiliate Members ($150 USD for non-members). Submit tracking information to exhibits@atla.com by Friday, June 8. We cannot guarantee they will be stuffed without tracking information. Promote your company and new products with an e-mail sent to all registrants who opt-in to receive e-mails. Cost: $300 USD. Please e-mail exhibits@atla.com with your html copy by Wednesday, May 1. The Atla Newsletter is read by nearly 800 theological librarians, academic deans, administrators, and students. Atla Members receive an emailed digest on the second Tuesday of every month. Learn more about sponsoring an email. 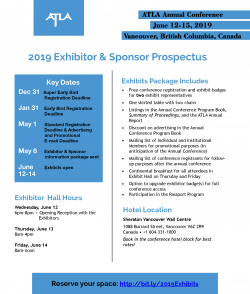 All your questions answered about exhibiting or advertising at Atla Annual 2019.